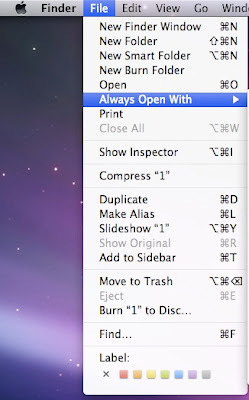 A New Mac Tip Every Day: Always Open With in the Finder! There is an Open With command in the Finder that lets you choose with which application you want to open a file. If you hold down Option however, the command changes to "Always Open With". This will let you quickly change the default application used to load a specific kind of files. yeah!! i've been lookin for this for ages!! thanks!! Also, if you right click on a file and go to "Get Info", you can then go to the "Open With" option, select the program you want to open that particular file type with....then below, click "Change All." That way, all files with that extension will always open with a particular program (ie - change all .html files to open with your text editor of choice rather than in your browser...or all .png files to open in photoshop rather than preview). This may not be new to a lot of people, but I felt it was sort of relevant to today's tip and some people may find it useful, I sure do. Nevermind my previous comment, MacGeek's tip does the exact same thing I just described and is much easier...I misread his post the first time I read it........oh well, now you know two ways to do this!